8 ROOF COATINGS 2018 COATINGSPROMAG.COM By Ben DuBose Photos Courtesy of GAF, Gardner-Gibson, Icynene-Lapolla, KARNAK, Kemper System, Momentive Performance Materials, MSA Safety, National Coatings, Polyglass USA, Inc., Polyurethane Machinery Corporation, Rust-Oleum, SprayWorks Equipment Group, and Tramex Meters Top-Shelf Jobs: How to Navigate Roofi ng Projects N o matter the substrate or location, any job involving the application of protective coatings and/or spray polyurethane foam (SPF) systems can present its own unique challenges. However, roofi ng jobs often add even more variables for contractors to consider. e logistics of working outside and safely access- ing extreme heights — and, at times, navigating considerable slope — are key considerations along with the basics, such as inspections, surface preparation and repair, material choices, application strategies, and more. To help contractors overcome these tall tasks, CoatingsPro spoke with several roofi ng industry experts to gather intel on best practices and potential product and technology solutions for use across all of the various stages at a jobsite. 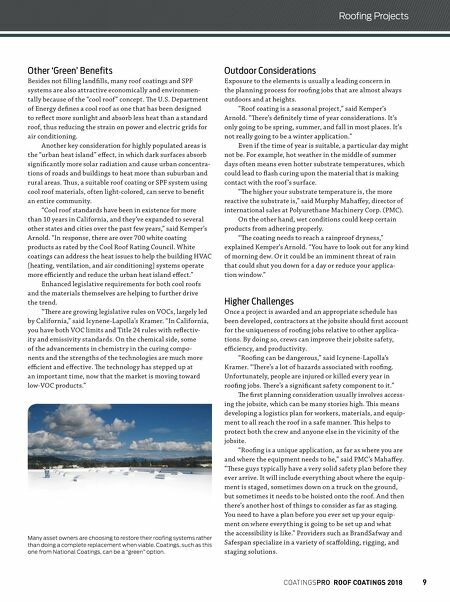 Read on to see how contractors can come out on top in the application of coatings and/or SPF on roofi ng projects. Roof Restorations Rise Roof coating projects are becoming increasingly popular as a more environmentally friendly and economical alternative to a complete roof replacement, in which the tearing off process is costly and can fi ll landfi lls. 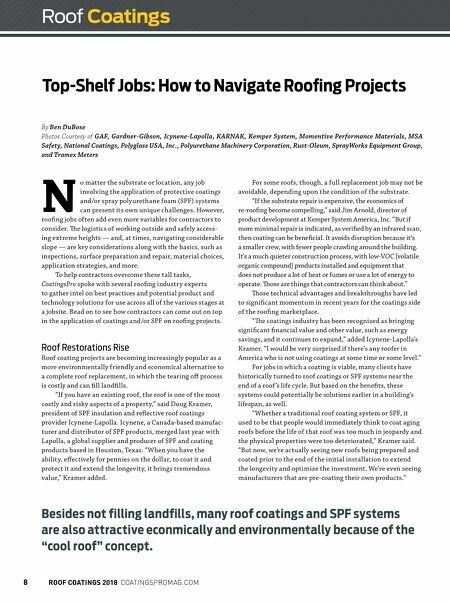 "If you have an existing roof, the roof is one of the most costly and risky aspects of a property," said Doug Kramer, president of SPF insulation and refl ective roof coatings provider Icynene-Lapolla. Icynene, a Canada-based manufac- turer and distributor of SPF products, merged last year with Lapolla, a global supplier and producer of SPF and coating products based in Houston, Texas. "W hen you have the ability, eff ectively for pennies on the dollar, to coat it and protect it and extend the longevity, it brings tremendous value," Kramer added. For some roofs, though, a full replacement job may not be avoidable, depending upon the condition of the substrate. "If the substrate repair is expensive, the economics of re-roofi ng become compelling," said Jim Arnold, director of product development at Kemper System America, Inc. "But if more minimal repair is indicated, as verifi ed by an infrared scan, then coating can be benefi cial. It avoids disruption because it's a smaller crew, with fewer people crawling around the building. It's a much quieter construction process, with low-VOC [volatile organic compound] products installed and equipment that does not produce a lot of heat or fumes or use a lot of energy to operate. ose are things that contractors can think about." ose technical advantages and breakthroughs have led to signifi cant momentum in recent years for the coatings side of the roofi ng marketplace. " e coatings industry has been recognized as bringing signifi cant fi nancial value and other value, such as energy savings, and it continues to expand," added Icynene-Lapolla's Kramer. "I would be very surprised if there's any roofer in America who is not using coatings at some time or some level." For jobs in which a coating is viable, many clients have historically turned to roof coatings or SPF systems near the end of a roof 's life cycle. But based on the benefi ts, these systems could potentially be solutions earlier in a building's lifespan, as well. "W hether a traditional roof coating system or SPF, it used to be that people would immediately think to coat aging roofs before the life of that roof was too much in jeopardy and the physical properties were too deteriorated," Kramer said. "But now, we're actually seeing new roofs being prepared and coated prior to the end of the initial installation to extend the longevity and optimize the investment. We're even seeing manufacturers that are pre-coating their own products." Roof Coatings Besides not filling landfills, many roof coatings and SPF systems are also attractive econmically and environmentally because of the "cool roof" concept.